If you’re a regular here on the SWLing Post, you’ve no doubt discovered that I’m a fan of vintage radios. Lately, I’ve been attempting to let go of some of my vintage gear to give my favorite rigs proper shelf space and dedicated antenna time. To keep temptation at bay when I visit flea markets or hamfests (like Hamvention and the one in Shelby, NC) I now focus on WWII era radios; specifically “morale” radios that were used for troop entertainment. I’ve two morale sets: the Scott Marine Radio Model SLRM (technically, a commercial version of a Navy set) and the Minerva Tropic Master. I purchased this Minerva set off of eBay a couple years ago. I got it for $50 or $60, if memory serves (the seller originally wanted $180 + shipping!). He claimed it worked, but after I asked him a few questions prior to making an offer and learned that “working” meant the speaker prodeced a noise and the backlight worked. I made a low offer and he accepted. Last year, I took Minerva over to my buddy, mentor and boat anchor doctor, Charlie (W4MEC). Charlie discovered the radio had many issues and several poorly implemented repairs. Still, in a few short weeks, when parts arrived he brought the girl back to life. The Tropic Master is a portable eight tube receiver that covers both the AM broadcast band and shortwave bands from 5.5-18 MHz. It can be powered by AC or DC. It was “tropicalized” to withstand extreme heat and humidity. The internal speaker produces mellow, full-fidelity audio and the volume can be increased to room-filling. The Tropic Master is portable and even has a fold down handle on top of the chassis. Though substantial, it must be the lightest of all of my vintage metal chassis radios. Tuning isn’t exactly precise, but it does the job and is a pleasure to use. It’s quite sensitive on both shortwave and mediumwave. Last night, she was tuned to the Voice of Greece on 9420 kHz–I probably listened to two hours of Greek music while her eight tubes warmed the shack. Who could turn down a radio with this speaker grill? If you ever find a Minerva Tropic Master at a flea market or hamfest, I say adopt one! It’s a beautiful receiver and like all good vintage radios has a story and history of its own. Post readers: Any other Tropic Master owners out there or do you have a morale radio? Have you ever spotted a Tropic Master in the wild? Please comment! This entry was posted in AM, News, Nostalgia, Radio History, Shortwave Radio, Vintage Radio and tagged boat anchors, Minerva Tropic Master, The UK 1940s radio station, Vintage Radios, WWII, WWII Radio on January 7, 2018 by Thomas. Several months ago, I wrote a post confessing that I recently embraced internet radio, and since then have been using a very affordable Cricket Android Phone as an inexpensive, portable wi-fi radio. You see, though I prefer listening to shortwave radio, and though there are notable exceptions, it’s not always the best source to pipe music through the hi-fi system in our house. At one point, I actually subscribed to XM satellite radio. I eventually dropped it, and found there were only two things I really missed from XM: Tom Petty’s Buried Treasure, and the 40s on 4 station, which played music from the 1920’s, 30’s and 40’s. Fortunately, there is an excellent radio station–indeed, better than XM/Sirius’ 40s on 4–that fills my need for nostalgic radio, The UK 1940s Radio Station. The UK 1940s Radio Station runs 24 hour a day and plays an amazing mix of 1940s era music. 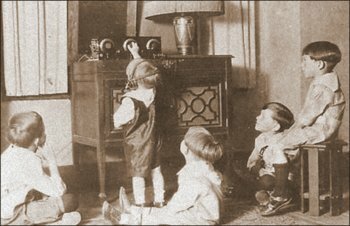 Unlike 40’s on 40, The UK 1940s Radio Station has authentic recordings of news clips and even original advertisements they play throughout their music mix. The 40s on 4, at least when I last listened, still had a pseudo-1940s-sounding announcer (Ed Baxter) and often reproduced news broadcasts; I prefer the real period recordings, personally. Also, The UK 1940s Radio Station has interviews and commentary from experts on the era. The UK 1940s Radio Station are supported by their listeners, so if you like their programming, consider supporting them with a donation via PayPal. This entry was posted in Music, Nostalgia, Slightly Off Topic and tagged 1940's internet radio station, 40's on 4, Decades, Nostalgic Radio, Sirius, The UK 1940s radio station, XM, XM Sirius 40's on 4 on November 10, 2012 by Thomas.